A few weeks ago, a 95-year-old patient came to see me on a gurney. He had severe, unexplained eye pain and needed to be examined as soon as possible. It was heart-wrenching to watch him groan in distress. He had seen three other doctors at his nursing facility who weren’t able to diagnose his problem at the bedside. It took an hour-and-a-half to get a team to bring him to the office and transfer him from the gurney to the slit lamp so I could evaluate and treat him. The exam and treatment took 50 minutes as he had difficulty positioning his head due to severe muscle cramping. With the extra time and specialized equipment, we were able to address his problem and he left the office with a smile on his face and pain free. No words can describe the tremendous fulfillment I get from caring for our nation’s seniors—the pillars and backbone of our country. There is no greater reward than enhancing their quality of life by going the extra mile to diagnose and treat their complex medical problems. Seniors typically have the most severe eye disease and the most complicated medical histories and medication lists. When considering their limited mobility, disease severity, and hearing loss, (and accounting for the time it takes to write out their treatment plans, communicate with their caregivers, transfer them in and out of the exam chair, fill out transportation forms, and write orders for their nursing facilities), one senior eye exam takes, on average, 4-5 times longer than examining one individual under the age of 60. We have a moral duty to provide the highest quality of medical care for our senior citizens. However, it is increasingly challenging for physicians to fulfill this responsibility. If Medicare cuts continue (including recent proposals to reimburse more complex visits at the same rate as shorter visits), physicians and healthcare systems are likely to dramatically cut the numbers of Medicare patients they see, or reduce the time for senior visits. I sat down and did the math. If we continue to see Medicare patients with the proposed pay cuts, our clinic will face tremendous financial strain as our operating costs continue to skyrocket. However, we would be able to sustain a younger practice as private insurance plans generally pay more than Medicare for a visit, and the time to treat younger patients is on average 25% of the time it takes for a senior visit. Will cutting physician reimbursements be a beneficial solution to reducing our nation’s escalating healthcare costs? Are the physicians at the root of all the rising healthcare costs in our country? Contrary to common belief, physician reimbursements are not the top healthcare expenditure for our country. In 2017, less than one-fifth of our nation’s total healthcare spending went to physician reimbursements. 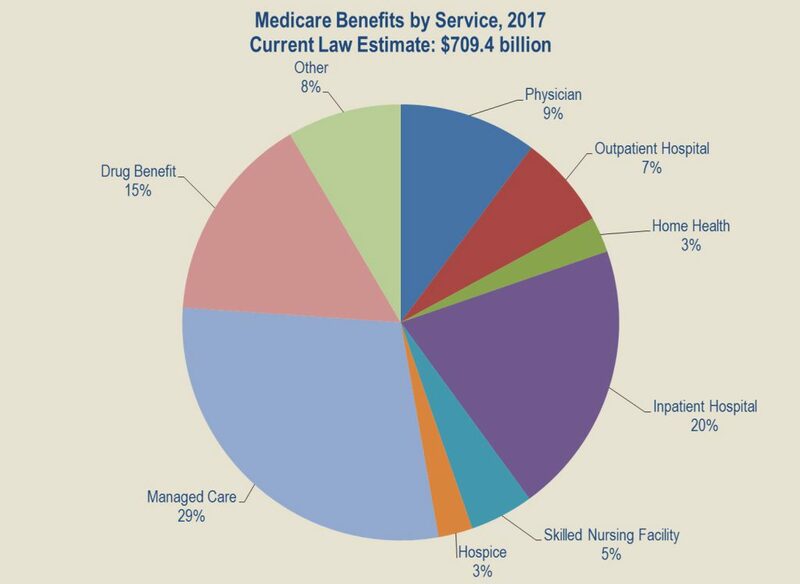 In addition, in 2017, just 9% of Medicare Benefits were allotted for reimbursements to physicians. Over the last two decades, Medicare physician reimbursement rates for numerous common procedures—i.e., colonoscopies, hernia repairs, cataract surgeries, knee replacements and many other routine procedures have plummeted. For example, the payment rate for diagnostic colonoscopy for gastroenterologists declined significantly. Non-facility reimbursements were slashed by 16.5% from 2016 to 2017. At a rate of $195.23 for a facility colonoscopy in 2017, gastroenterologists earned less than most plumbers when accounting for the unit time of their procedure and follow ups. In comparison to a plumber, gastroenterologists have 14 years of extra schooling after high school, time-consuming and expensive re-credentialing, and often accrue hundreds of thousands of dollars of debt. They also run the risk of getting sued if a patient gets a perforated colon, an infection, or other complications from the procedure. In 2010, Medicare stopped offering stronger reimbursement rates for physician visits labeled “consults”—consults require a substantial amount of extra time as physicians must write consultation notes and communicate with referring providers. As a result, many private insurers have followed suit and have also stopped providing additional compensation for consults. This coding change has contributed to cumulative financial losses for physician practices. Medicare payments for physician professional services run far behind inflation. 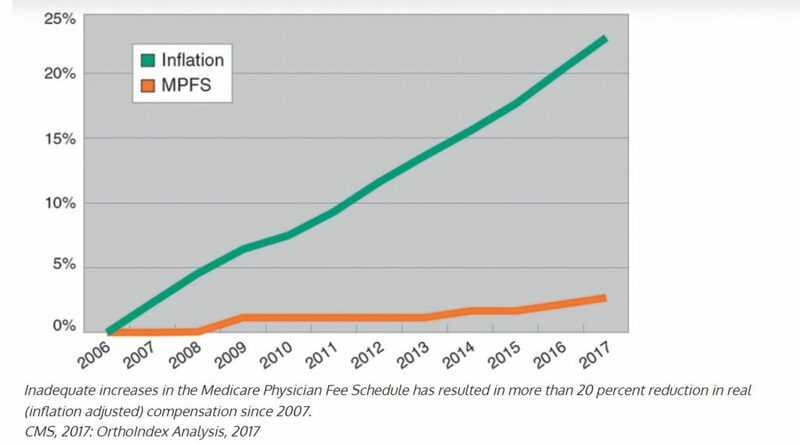 In the last 11 years, the Medicare Physician Fee Schedule (MPFS) increased an average of 0.24 percent annually while inflation increased an average of 1.88 percent annually—an average difference of 1.64 percent. Inadequate increases in this fee schedule has resulted in more than a 20 percent reduction in real (inflation adjusted) compensation since 2007. By failing to keep pace with inflation, this relative reduction of revenue and subsequent practice margin has forced many private physicians to shut down their practices and retire early or opt for employment opportunities. We are in a situation where our senior population is rising exponentially, the supply of doctors is falling precipitously behind this demand, and a new plan to cut physician reimbursements even more will reduce access to essential healthcare for our seniors as more physicians choose to opt out of taking Medicare. Patients will have to wait even longer to find physicians who will provide them with the care they need. These lag times will be deleterious to their health. 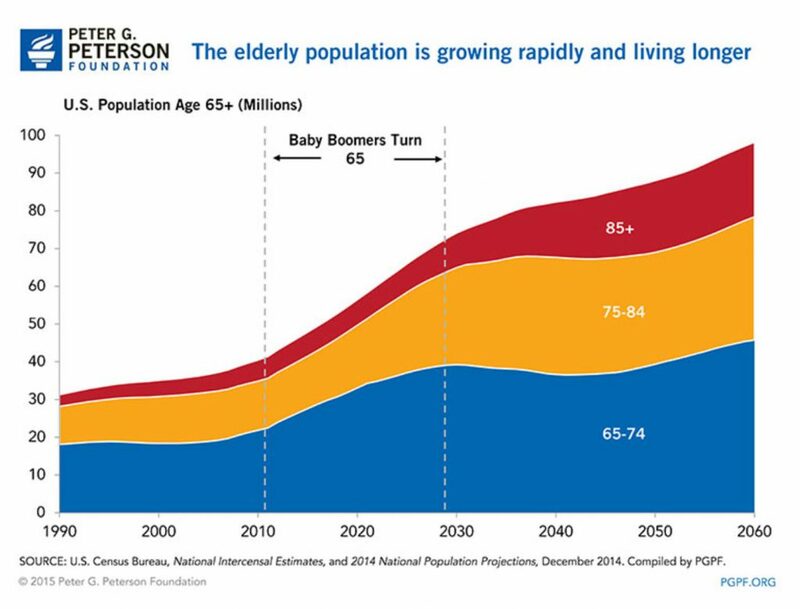 Our country faces a serious physician shortage that is predicted to get dramatically worse as our population over 65 explodes. 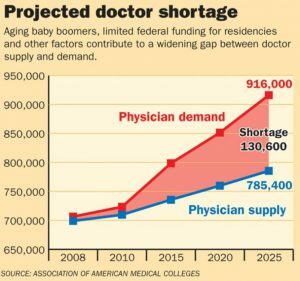 By 2025, there will be a predicted shortage of well over 100,000 physicians. Many physicians are opting to retire early and new graduates have fewer incentives to enter primary care careers. A recent DoctorCPR Poll with 257 private physicians from across the country revealed that over 39% of physicians in private practice plan to stop taking Medicare if the proposed flat reimbursement pay schedule went through (even despite the option offered to bill for extra time or any proposed relief in administrative burden). That is a significant and alarming percentage. 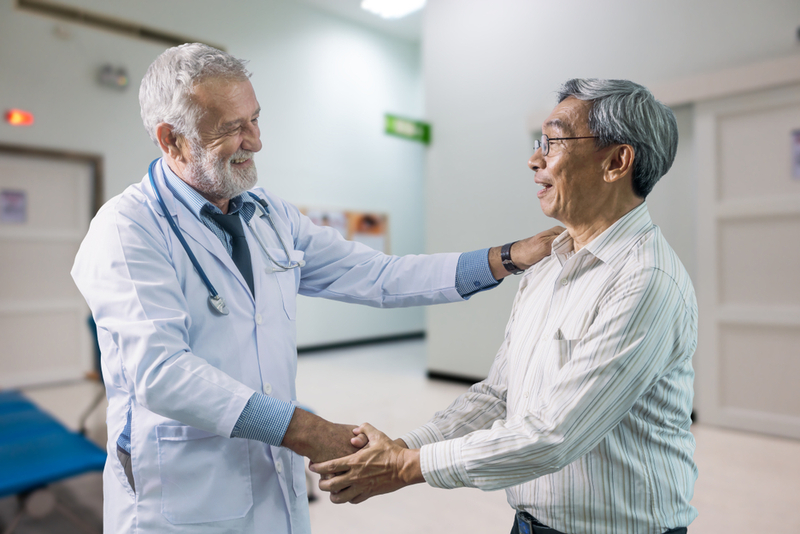 Incentivizing doctors to refer seniors with more complex medical problems out of their practices will also engender feelings of rejection and abandonment in our seniors. We will begin to see a domino effect where the sickest senior citizens–who need comprehensive care and emotional support the most–will become the most neglected. But that is exactly what we need to avoid. Quality of care for our seniors is often proportional to the time we spend on relationship building, preventative care counseling, adequate history taking, explaining disease processes, and close coordination of care. When we cut this process short, we are unable to adequately assess the needs of the patient and explain the treatment plan in sufficient detail. Increased frequency of visits will be a significant additional burden to our seniors who often have limitations in mobility and the ability to get caregivers accompany them to visits. Pay cuts that dis-incentivize physicians to spend more time with patients (especially our seniors who need the most time and attention) will produce an environment where quality of care will decline. To make ends meet, doctors will start bringing back seniors for an increased frequency of visits, reduce the time allotted for senior visits, or refer out the more complex Medicare patients to other providers who will, in turn, refer them out to other providers and so on. As the administrator of a physician community of over 250,000 doctors, I frequently receive candid feedback from many of our nation’s most talented physicians. 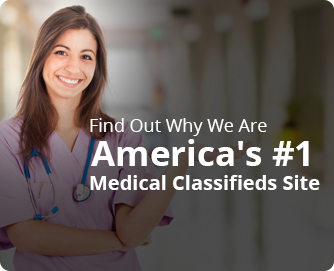 These doctors are passionate about providing quality, compassionate care for their patients. 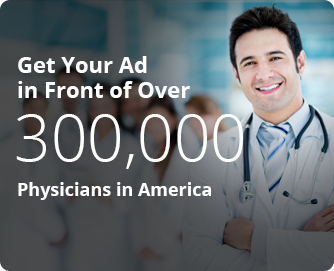 Physicians want to contribute, collaborate, and become a more valuable part of our nation’s healthcare decisions. Let us consider physician feedback as our nation’s top leaders propose new solutions to optimize healthcare delivery while minimizing costs. The quality of our healthcare is too important to risk hundreds of thousands of talented physicians opting out of Medicare. With additional reductions in reimbursements, it will not be sustainable for doctors to continue providing a high level of compassionate care for our nation’s most vulnerable and deserving population. This entry was posted in Doctor Shortage, Healthcare Policy, Physician Reimbursement and tagged doctor reimbursements, medicare pay cuts, medicare pay cuts for doctors, medicare pay for doctors, medicare pay proposals for physicians, medicare physician reimbursements, new medicare laws for doctors, physician reimbursement cuts from medicare, physician reimbursements, physicians leaving medicare, physicians opt out of medicare, private practice physician bankruptcy by Drpost. Bookmark the permalink.